Happy Friday! 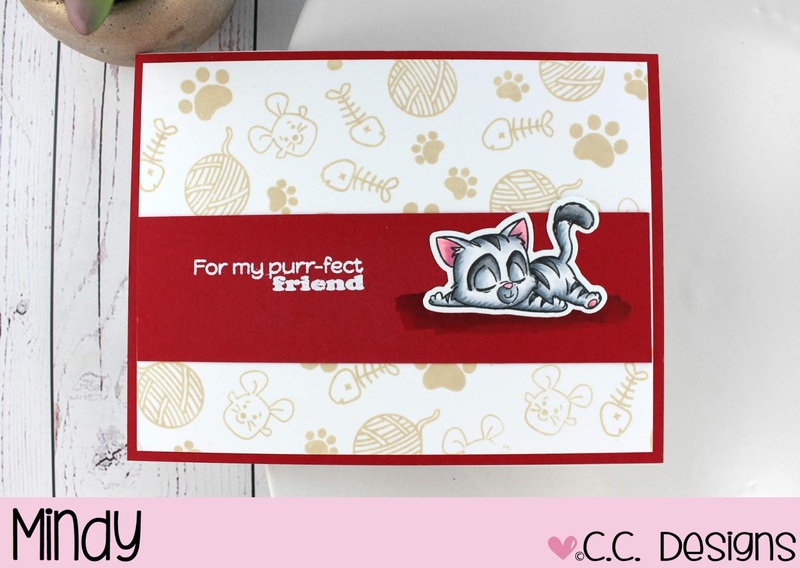 Today’s card is featuring the ever so adorable Cutie Cats from C.C. Designs! If you haven’t gotten your hands on it yet – you totally should! So many fun images on this set! I’m going to start out my card by creating a background. I randomly stamped some of the smaller images from this around on a piece of Neenah white cardstock with Sandy Beach Gina K Ink. This piece is measured to 4″ x 5 1/4″ to fit ontop of a red A2 size notecard. Using a strip of that same red cardstock cut down to 1 1/2″ x 5 1/4″ I heat embossed this fun sentiment with white embossing powder. My sleepy kitty is stamped onto Neenah white cardstock with copic friendly ink and colored in with copic markers. Then I used the coordinating die to cut out my image. Before adding to the card, I lined up where my image would go and added some shading with my Cool Grey marker. Then attached my kitty. So simple and sweet! Hi everyone! Hope you are all staying cool. Our temps are really creeping up today… I think it’s high 80’s right now and sticky but it’s better then snow so I’m all good with it! 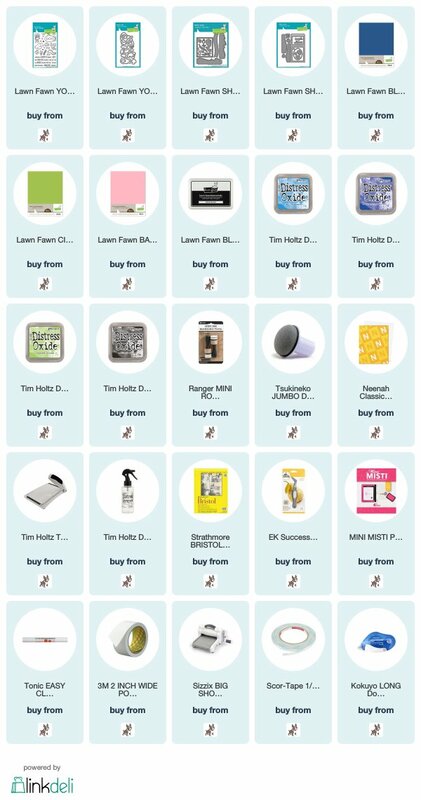 I have been having a blast playing with the new release from Lawn Fawn. Today’s card is using the Ocean Add ons to the Shadow Box Card. I’m also using this for the Mood Board challenge over at the Lawn Fawnactics challenge blog. These shadow boxes are really fun to decorate. I suggest creating a mock up first using random scraps maybe. 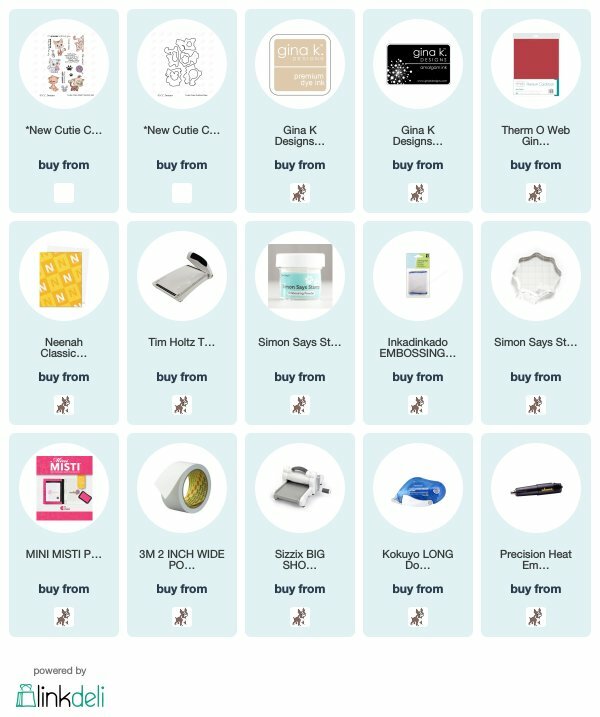 This helps give you an idea of where everything goes and what you can add. I’m a very visual person so when I have a mock up sitting on my desk, it’s a lot easier for me to get a little creative. The Ocean Add on has some cute ocean waves for the inserts in which I ink blended Salty Ocean, Blueprint Sketch and Black Soot Distress Oxide ink. For the back and side panels I ink blended Twisted Citron, Salty Ocean and Blueprint Sketch Distress Oxide ink. I thought this was a cute addition to really make it an underwater scene. You can see I added some of the algae die cuts that also come with the Ocean Add on die. All of my images are from the You Are Sublime stamp set of which I stamped onto Neenah white cardstock with copic friendly ink. Then colored with copic markers and diecut with the coordinating die. I’m always in need of Thank you cards so I love this sentiment that comes in the You Are Sublime stamp set. I think the teachers will love this! I also have a video to share my process. You can view it down below or HERE on my Youtube channel. Welcome back! 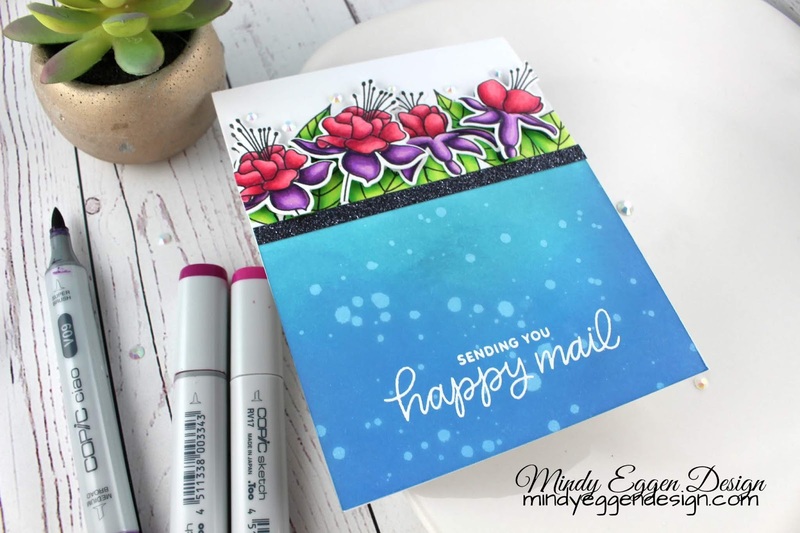 I’ve been itching to play with this gorgeous new stamp from Pretty Pink Posh! I originally had planned to make a one layer card but if you head over to my Youtube video and check that out, you’ll understand why it’s not lol. I’ve actually been sick since last week and I created this card probably at my worst. I should have been sleeping but thought maybe coloring and creating would help me. It didn’t lol… I actually made quite a few mistakes throughout this card but kept going and didn’t start over. I’ll give you the basics here on the blog but I highly suggest heading over to watch my video. I originally started by creating masks for my images and stamping them across my card panel with Gina K Amalgam ink. I had added a strip of 2″post it tape to mask off the bottom portion of my card. I removed the mask and added it over my stamped images so I could ink blend the bottom. I used Broken China, Salty Ocean and Blueprint Sketch Distress Oxide inks. Then splattered with water and dabbed with a paper towel. Since I had messed up on a portion of the coloring of the flowers, I restamped them and colored them the way they were supposed to be. Then I diecut them with the coordinating dies. Some of them I added straight to the card and some I popped up with foam squares. Then trimmed off the stems. I added a strip of Black Glitter cardstock to separate the flowers from the ink blended portion. Making sure everything was dry, I them prepped my cardstock with an anti static powder tool and heat embossed the sentiment from Happy Mail in white embossing powder. To finish off the card, I added some of these gorgeous Pearl Jewels above my flowers. Considering all the hiccups I had in creating, I’m really happy with this card and so thankful I kept going! You can view the video down below or HERE on my youtube channel. I would love to hear what you think! 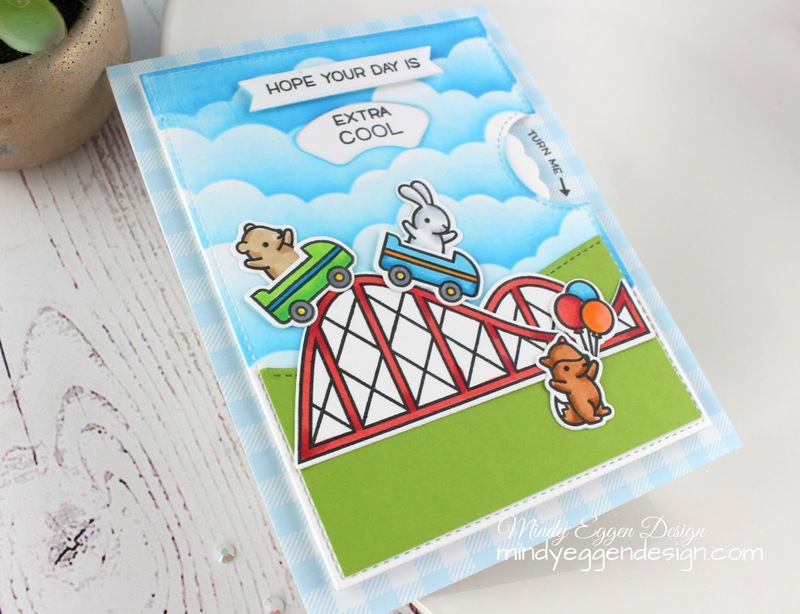 Coaster Critters Reveal Wheel – Lawn Fawn! Hey everyone! Today I’m sharing something “extra cool” ! I’m also participating in the Lawnfawnatics Challenge going on right now. The challenge is creating something inspired by their mood board and one of the images inspired me to create something with a summer theme. I totally splurged on the new release and so glad I did because it’s amazing! This Reveal Wheel is absolutely awesome, so much fun to create with and easy!!!! I started out by cutting my Reveal Wheel from some Bristol Smooth cardstock and ink blending some clouds onto the background with Salty Ocean Distress Oxide Ink. I diecut a hillside from Cilantro cardstock with the Stitched Hillside Border and added it to the inside of the stitched lines. 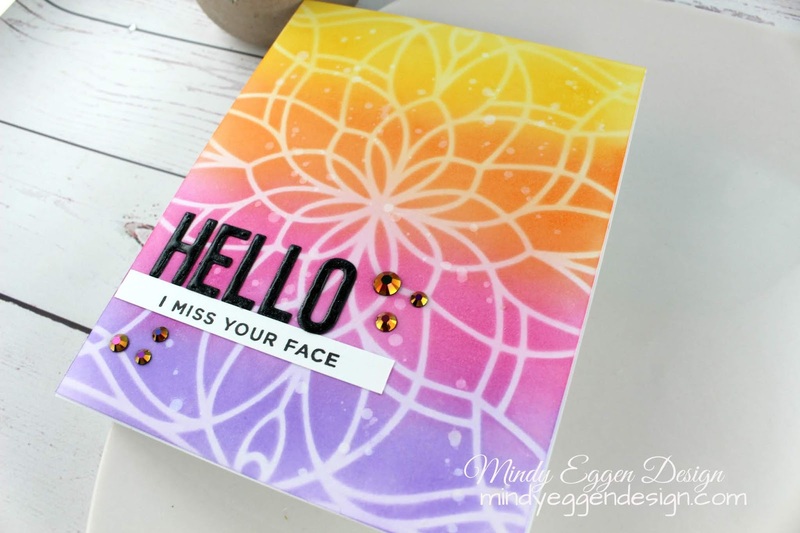 I went through and stamped all of my sentiments from the Reveal Wheel stamp set. I also stamped “Hope your day is” sentiment and diecut it out from the banners die. My cute little critters from the Coaster Critters set are all stamped onto Neenah white cardstock with copic friendly ink and colored in with copic markers. Then diecut out with the coordinating die. Then I could start building my scene. I used a piece of Gotta Have Gingham patterned paper for my background and added this card to an A2 size notecard. This is so fun to make !!! Don’t be surprised if you see a lot more of these from me! I know I didn’t include complete instructions of putting the Reveal Wheel together but that’s because I highly recommend checking out Kelly’s video over on the Lawn Fawn Youtube channel. I’ll link it HERE. It’s so much easier to understand how it goes by watching the video and honestly once you create it, it’s so super easy! 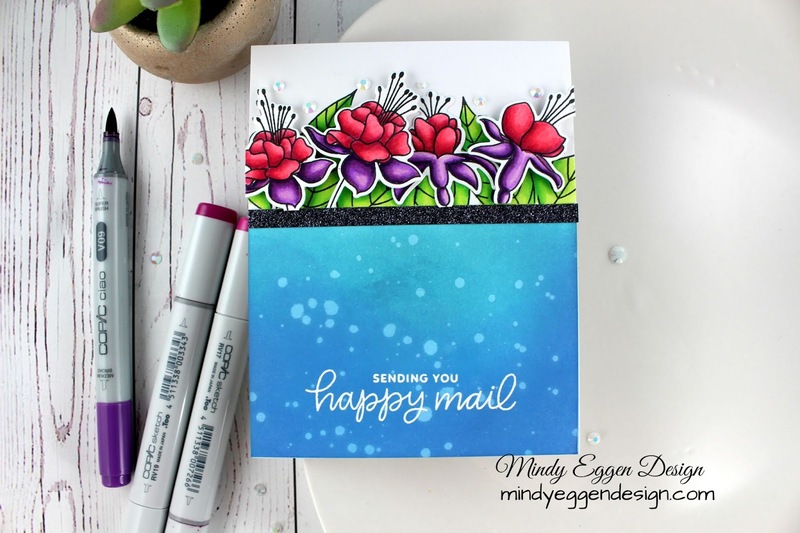 Stencils with Simon Says Stamp! Greetings all!! I have been down for the count with a horrible head cold that I got last week. I thought it was allergies at first (and who knows maybe it is) but it sure just feels like a bad head cold. I finally felt good enough to sit down and create. 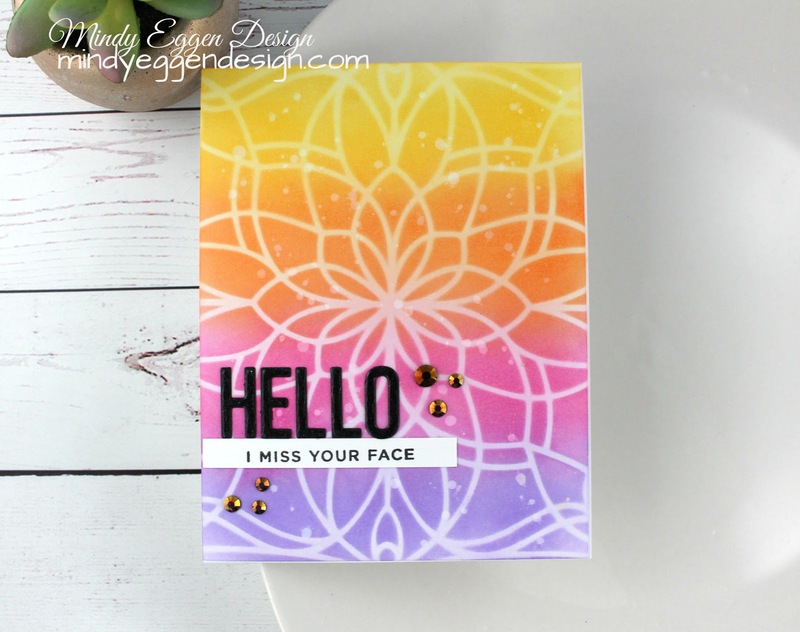 Today’s card is for both the Simon Says Stamp Wednesday Challenge featuring Stencils and also for the Simon Says Stamp Flickr Group Challenge – Stencil it! I mean, seriously, how could I pass this up!? 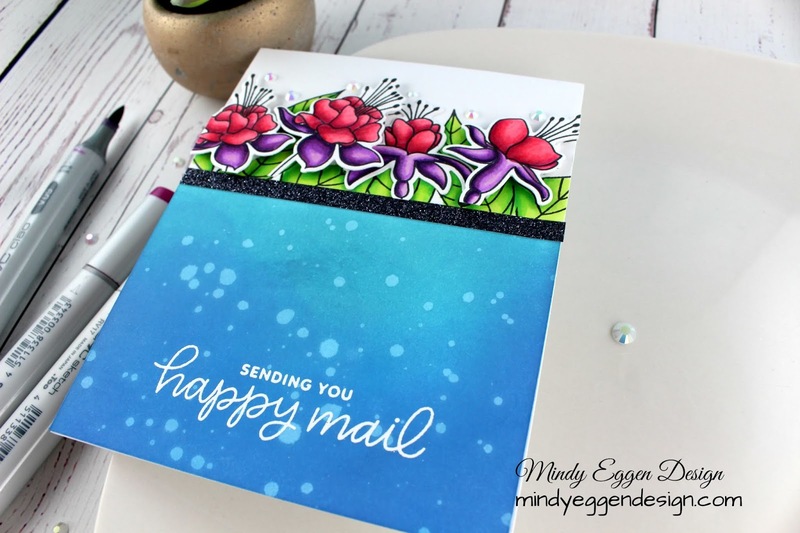 I’m using the beautiful Carolyn Stencil from Simon Says Stamp. I’m ink blending Wilted Violet, Picked Raspberry, Carved Pumpkin and Mustard Seed Distress Ink onto Bristol Smooth Cardstock. Once I remove the stencil, I’ll lightly go back over all the colors to soften it up. 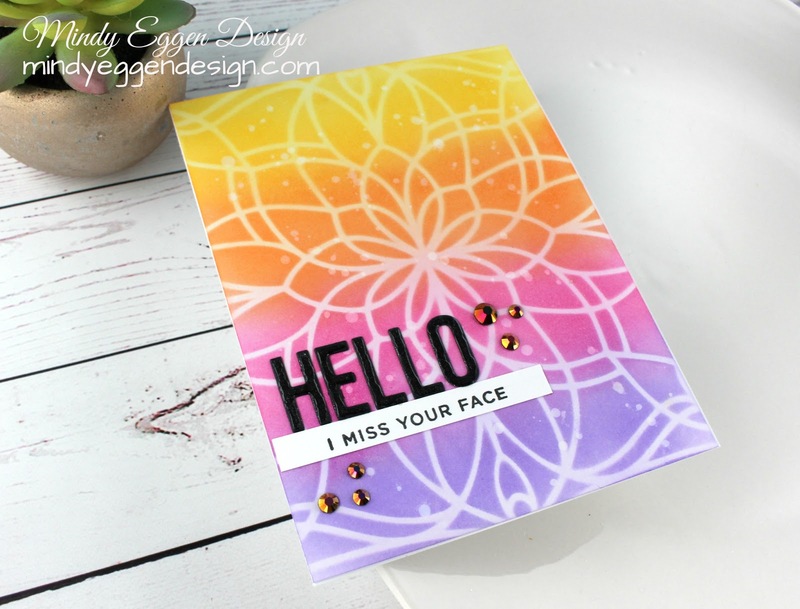 I diecut the word Hello from the Happy Greetings die set with black cardstock and attached to my card panel with some Gina K Connect Glue. 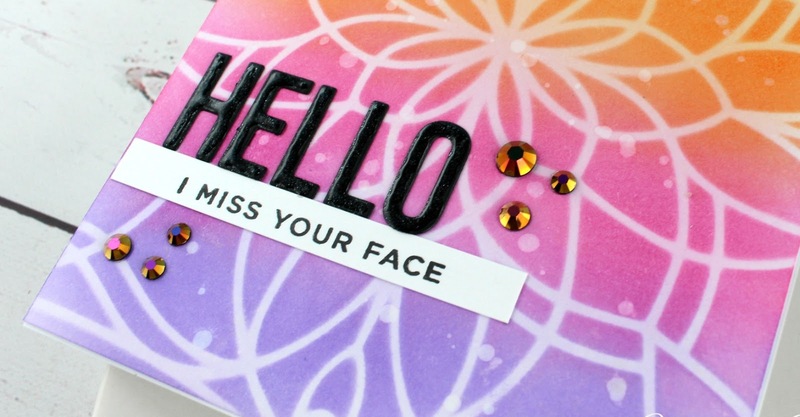 I stamped this fun sentiment onto a white strip of cardstock using the Simple Sentiments stamp set. For a little added dimension, I added these gorgeous Rose Gold Jewels from Pretty Pink Posh. I was a little nervous how’d they look with the colors but I love it! I also added some Nuvo Shimmer to the Hello and topped it off with some Crystal Glaze. 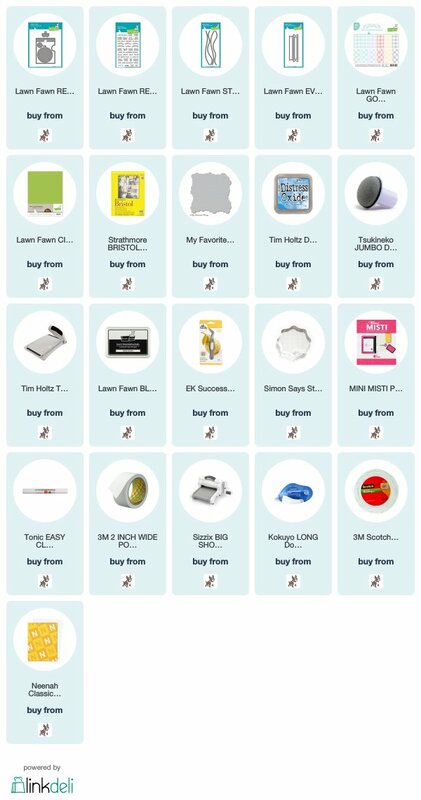 Be sure to check out the Simon Says Stamp Wednesday Challenge and the Flickr Group for chances to win a gift certificate. There is still time left to play!